PTF Hair Removal is an advanced medical-grade variation of IPL technology. PTF differs from beauty salon IPL in several ways. Sapphire lamps instead of glass direct light with greater accuracy and effect. Because the light is more pure and controlled, there is less light-scatter, and that means much better results and far less discomfort. Another big difference is that Reef's machines are manually cooled instead of water cooled. This allows far greater control over the intensity of light and heat delivered to the hair bulb, and used effectively, can be up to 7 times more powerful than a beauty salon machine. Yet despite all this power, clients invariably comment that they can barely feel the treatment. 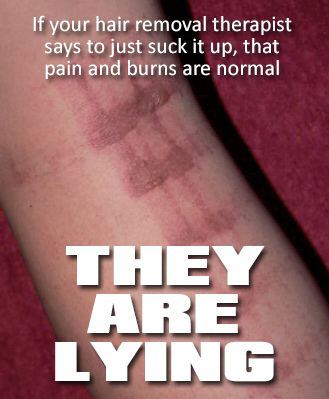 It isn't painful at all, and if you've ever tried laser you'll immediately notice the difference. You're probably wondering if PTF is so good, why isn't everyone using it? That's easy. PTF takes months to learn properly and years to become truly skilled, whereas beauty-grade IPL is a weekend course. I take Hair Removal seriously. It isn't just one of many services I offer - It's the bulk of what I do, and to ensure that continues I want my clients to go away knowing they've had the very best treatment money can buy. I've tried everything over the last few decades - E-Light, SPL, Laser, both Yag and Alexandrite. Always, I keep coming back to medical-grade PTF. Reef's systems combined with years of experience allow us to be versatile in our thinking, to treat each client's skin and hair as individual and distinct from everyone else, and to think on the run. We don't try to be experts at everything, but we are experts at Hair Removal. So, that's the basics. Below you'll find Reef's Prices for PTF Hair Removal, and further down the page, the largest Question & Answers section in the country. I believe strongly in client education as there's a great deal of conflicting information on the web, and I encourage you to browse the Q&A so you can see what other people commonly ask about our treatments. If you have any questions, please don't hesitate to call on 49267778 or use the online form on the contacts page. I offer two grades of hair removal treatment because different people want different things. Some want the lowest price while others want the fastest results. The choice is yours. The cheaper service is IPL which is similar in efficacy to laser, while PTF is our premium grade of hair removal. IPL and laser are cheaper and the treatments are very quick, while PTF sessions take longer to perform and are more expensive. * TGA LISTED EQUIPMENT with very high energy output. * PRICES ARE WHAT YOU ACTUALLY PAY - not "starting from"
* FREEDOM OF CHOICE - You decide your price point - IPL or premium PTF. * HIGHLY QUALIFIED THERAPIST - owner operated with 17 years hair removal experience. * PRICE FREEZE GUARANTEE - The first price you pay for a treatment area is locked in forever. * NO BULK BUY SCHEMES - My prices are sharp and I achieve results. I don't need to trap you. My section on Permanent Hair Reduction is one of the largest and most comprehensive FAQs in the world. It is 100% original content drawn from experience, not rehashed material from someone else's website. Much of my research has been used as source material for reference sites, including Wikipedia. For these reasons, Reef is regarded even by its competitors as a leading authority. The information is added to frequently to keep it current and relevant to you as a potential consumer, and is designed to help you make an informed decision. However, because this section is so large, I'm progressively breaking it up to create a 'quick-read' FAQ with linked articles in the Reef Knowledge Base. Where I've done this in the FAQ, you will find a 'further reading' button if you want to explore the subject in more detail. Note: To save longwinded explanations and duplication of info, questions about IPL also apply to PTF unless it specifically states otherwise. If you still have questions, please feel free to call. Why do you favour IPL technology over laser? I can buy a cute little IPL machine online. Why come to you? Why is the number of joules important? My teenage daughter has facial hair. Can you help? Do I need to pay for all my treatments upfront? I heard that I should only get 'permanent hair removal', not 'reduction'. I've heard that under arm deodorant can interfere with my treatment. Is this true? I'm female with excessive hair growth that runs in my family. Will this treatment help? I'm a franchisee of a large hair removal chain. We've been forced to upgrade to new tech and I'm bleeding customers. Help! I jumped a month and all my hair is growing back! I have Polycystic Ovarian Syndrome. Does this rule me out as a candidate for hair removal? What result can I anticpate from a course of hair removal treatments? How regularly should I come for a hair removal treatment? What's the difference between liquid-cooled and air-cooled machines? Won't shaving make my hairs grow back thicker? Can I use hair removal creams or sprays instead of shaving? I'm a therapist and have a client with borderline dark skin. Is there a safe way to do a treatment? I want to get a full sleeve tattoo in six months. That will be fine, right? Do hair removal treatments work on everyone? I used to get SIPL from Reef but can't find it on your website. How painful is pulsed light hair removal? I'm going somewhere else and it's hurting, but they're a qualified doctor/nurse/beautician. I've been burnt by a mobile IPL service. Is this normal? Other places charge consult fees, credit card surcharges, and room fees. What are your hidden extras? Will you do a cheaper price if I pay for all my treatments upfront? What could prevent me having a hair removal treatment? Are your machines registered with the Australian Therapeutic Goods Association? I'm confused by all the jargon. IPL, VPL, Elos - What does it mean? Do I need a preliminary hair removal consultation? I can get a cheap price on a daily deal site. Why come to you? You used to treat me in Brisbane/Gold Coast. I want more areas done. Where do I go? A friend is seeing you at Yeppoon but I can't find it in the phone book. I'm worried that I'll start my treatments on a promo price and you'll put the prices up. What will I notice between treatments? My daughter wants a Brazilian. How old does she have to be? How effective is IPL on blonde, grey, and red hairs? I'm of Aboriginal descent. Is my skin too dark to receive a hair removal treatment? Is Reef accredited by Queensland Health? If your service is so good, why are so much cheaper than everywhere else? Why can't IPL remove all of my hair in one treatment? Will I have to come back for top up treatments? I'm male and want a Brazilian. Will this affect my sperm count? I told my Reef therapist to turn up the settings but they refused. I'm pregnant and my top lip is sprouting hair. Can you help? I've had a pilonodal sinus excised. Will PTF Hair removal help? Can I book a wax and PTF hair removal for the same appointment? Why do you favour IPL over laser? I have used laser, both YAG and Alexandrite. I don't like it. It hurts far more than PTF and the results are highly variable. On top of that, the pre-care and after-care are crazy. I have people come in regularly complaining that they've had 20 or more laser treatments with negligible results, and my answer is always the same. Laser is cheap for a reason. It's like anything else - you get what you pay for. Laser clinics will tell you that laser is best, which begs the question, "Since laser is the older technology, and if it works so well, then why did they invent IPL?" The obvious answer is, "They needed something better." I can buy a cute little IPL machine at the department store. Why come to you? Commercial machines are large and bulky for a reason. They contain a massive power compressor to generate enough energy (joules) to actually kill the hair root. By comparison, a 12V transformer or a couple of AAA batteries doesn't quite cut it. The most powerful cutesy I've reviewed has a whopping 2.5J of energy. My PTF machines pump out 25 times more power. Cheap machines most likely won't achieve much, but they are capable of stripping melanin from your hair and once it's gone, you can't get it back. This may render you unable to receive a real pulsed light treatment. Joules equal the number of watts per square centimetre per second, and the higher the number of joules, the more energy (in conjunction with your skin type) we're able to get down to the target cells. When a hair is successfully eliminated, that's the end of it, but when a hair is targeted and the treatment fails due to insufficient power, a natural defence process kicks in. The body realises that its cooling system is under attack, and strengthens the hair against later attacks, i.e. further treatments. The hair grows thicker, the root grows in size, and the surrounding tissue tightens its grip on the hair. My waxing room sees the result of low-joule light treatments every day. Not surprisingly, this is why no other hair removal businesses discuss the power (or lack thereof) of their machines in their marketing. Unexpected facial hair, and indeed other parts of the body on teenage girls, is very common. Read this article for more info. What are the side effects of a hair removal treatment? Intense Pulsed Light converts light energy into heat, and it's the heat that destroys the hair at its root. There are generally no significant negative side effects, but I will give you a detailed information sheet when you arrive. Any possible risks to treatment are thoroughly described during your initial consultation and you also have the opportunity to ask about anything that may concern you. After your treatment, you can expect pinkness or a mild "sunburn like" effect in the area, however even this is rare and usually passes quickly. It isn't real sunburn, only heat permeating back out through the skin. You can go about your normal activities after a treatment, but be sun smart with treated areas and cover up or use a sunscreen. On the plus side, a pleasant side effect of IPL is that the technology uses specific wavelengths of light that stimulate cell renewal, increasing collagen production and smoothing the appearance of your skin. If you are thinking of coming in for hair removal treatments and collagen or pigment treatments in the same area, get the hair removal out of the way first and you may find that you don't need the other treatments. This proves to be the case a lot especially with faces and arms. No, this is a common trap in the Hair Removal industry. I don't have contracts, and I won't get you to sign a form committing to further treatments. if you have a treatment, you are under no obligation to return. I've had a pilonidal sinus excised. Will IPL stop it coming back? Pilonidal sinus is most prevalent in men and usually takes the form of massive localised swelling around the sacrum. It is an extremely painful condition requiring surgery, and unfortunately, it often recurs. After excision, the surgeon will usually recommend that hair from the area be removed to reduce the risk of another pilonidal sinus forming. IPL will progressively reduce hair growth in the area and is generally regarded as the best method for achieving the desired result. I do not recommend depilatory creams, waxing, plucking, sugaring, or electrolysis for combating pilonidal sinus. Except for electrolysis which is a 'one hair at a time' treatment and not suitable for large areas, it is actually illegal to advertise 'permanent hair removal'. That phrase implies absolute removal of every hair in the treated area for the rest of your life. No one can promise that. Laser, IPL - whatever technology you choose, is referred to by all professional operators in the hair removal industry as permanent hair reduction. This is also why no reputable business will guarantee results or use the term 'permanent hair removal'. In fact, a Perth salon was sued for doing just that. I heard that under arm deodorant can effect my treatment. is this true? Yes. if you are using a deodorant in the area that is being treated, make sure it does not contain aluminium oxide as this chemical builds up in your skin, and being metallic, it can block the light significantly. As a general guide, if you can see a slightly green or brown tinge in your underarm skin, then you have a build up of metallic substances in your skin which may affect the treatment results. This depends on many things, including your age, hormonal activity in your body, ancestry, medications or medical conditions. Essentially there are two types of hair that grow on the body (not counting the scalp). These are body hair which is generally thinner and softer, and pubic hair which is more coarse. Body hair usually responds faster to treatment than pubic hair. Lower legs, arms, lower backs, and bums are generally body hair. Genitalia, faces, chests and stomachs, and inner thighs are generally pubic hair. Underarms, upper backs and shoulders, upper legs, and bum creases can be a mix of the two. I always tell new clients that they will need a minimum of six treatment spaced one month apart, and basically to accept that they will need 6-8 treatments for body hair, and 6-10 for pubic hair. At that point, around 80-90% of people walk away happy with the result, while others elect to have more treatments. Facial hair on men is the most resilient, and can take upwards of 20 treatments. I'm female and have facial and excessive body hair. Other females in my family have it to. Will this help? Yes, it definitely can help. What you have is a genetic condition called Hereditary Hirsutism, which basically means that some females in your family (not necessarily all) have inherited a gene that produces male hair growth patterns. It isn't anything to worry about, and it is quite common, particularly in people with equatorial ancestry, e.g. the Middle East, Mediterranean, North Africa, Central America, and Indian subcontinent. However, the one thing you need to keep in mind during your course of treatments is that we will be fighting genetics. This means that you will end up needing more treatments than someone who does not have the condition. Help! I jumped a treatment and all my hair is growing back! Yep, well there's no surprises there. I cannot state this more clearly: Don't think you will be the exception - Everyone needs a MINIMUM of six treatments. It's common for people to notice after say four treatments that no hair is growing when it's time for their next treatment. Subsequently, people who don't take advice well, decide to ring and postpone their appointment. This is a HUGE mistake, because next month they ring back claiming that their hair has grown back with a vengeance. It hasn't grown back - This is the month's hair that we didn't treat because the client jumped a treatment, and now you'll have to wait six months for that bit of the cycle to happen again. Remember that we are treating hair bulbs that you can't even see, not the hair above your skin that is already dead. No matter who you are, you need at least six treatments spaced consistently, so we can cover the whole six month growth cycle. I have Polycystic Ovarian Syndrome. Does this rule me out as a candidate for treatment? Possibly, but not necessarily. Read this article then give me a call to discuss your situation further. What result can I anticipate from a series of treatments? In real terms, you could expect as a minimum result, a vast reduction in visible dark hairs. This may present or appear to present as absolute hair removal from the treated area, but as mentioned elsewhere here, we are not allowed by law to make such claims. The end result depends on your suitability to treatment, how many treatments you opt to have, and how regularly you space your treatments. How regularly should I come for a treatment? Most people have a 6 month hair growth cycle. 6 treatments in 6 months capture the greatest amount of hairs as they pass through the vital early-anagen phase of hair growth. Regular appointments help your therapist measure the efficacy of the last and earlier treatments, so they can determine the best energy/filter settings for the next treatment. What is the difference between liquid cooled and air cooled machines? When it comes to air-cooled or liquid-cooled (some call it crystal), I favour air cooled machines, simply because they're more efficient. Why? It's simple maths. The target temperature for permanently disabling a hair bulb is 73 degrees celsius. On a water-cooled machine, the head is pre-cooled to around 4 degrees. Therefore it has to generate 69 degrees to achieve the target result. Meanwhile, on a manual air-cooled machine such as one of my PTF units, I can allow that head to reach whatever temperature I want. With PTF, I cool the head manually with gel packs to keep it between 15 and 40 degrees - close to or slightly higher than room temperature. When the pulse of light flashes, it only has to produce say 40 degrees variance instead of 69 degrees to achieve the desired result, making a shot from an PTF machine up to 70% more effective. Speed-wise, water-cooled IPL is a quicker treatment due to having weaker energy output, usually between 30 and 50 Joules compared to an air cooled medical grade machine at 65 Joules. Naturally, water-cooled IPL machines are designed for beauty salons, as they are safer in the hands of inexperienced therapists, and the faster flash allow them to pump out clients more quickly. On the flip-side, air-cooled PTF takes longer but can provide a vastly superior quality treatment. Do I need to shave before my treatment? Except for chests and backs, ideally yes, as you will find it more comfortable to shave in the shower than for me to dry shave you in the treatment room. It also lessens the amount of time you'll spend on the table, and helps me keep Reef's prices affordable. Something to be wary of when shopping around for pulsed light treatments are machines that require you to shave 2 to 7 days before the treatment. Without naming brands, such machines are low powered and rely on visible hair to channel the light to the root, which tends to "sizzle" the hair above the skin. Ouch. This is another difference between beauty-grade and medical-grade IPL machines. Won't shaving make my hair grow back thicker? No, this is a myth invented by mothers long ago to stop their teenage daughters shaving their legs. The reason that hair SEEMS to grow back thicker after shaving is because you don't really start shaving until you get hair. Each time you shave afterward, the hair comes back thicker. Why? Because your body is producing it, hence your need to shave. It would produce exactly the same hair whether you shave or not. Hair growth is driven by hormones and nutrients at a cellular level, not by cutting off hair above the surface of the skin that is no longer connected to your blood supply. No. Hair removal creams are keratinocytes, ie they kill keratin cells. Keratin is the substance in hair that makes it solid. By dissolving the keratin, the hair becomes goo and wipes off. Unfortunately, keratin is also the substance that makes skin solid. Hair removal creams destroy keratin indiscriminately, which means your skin is left extremely vulnerable. Skin in this state means that a pulsed light treatment can have an anomalous result. It could cause pigment marks, skin burns, blisters etc, and for that reason we won't perform a treatment. if you've used hair removal creams or sprays, we need you to wait a minimum of one month before your treatment. I shouldn't have to qualify this question but I will. Your therapist will be me, Andrew Thompson, a male with 14 years experience in the beauty industry, and close to 30 years working with naked human bodies, as an artist, sports practitioner, remedial massage therapist, and acupuncturist. If you have issues with my gender, regardless of my experience and unblemished reputation over three decades, I'd prefer you went somewhere else. I want to have my arms done so I can get a full sleeve tattoo in 6 months. That will be fine, right? No. if you are planning to tattoo an area after hair removal, PLEASE wait at least 12 months - Better still, 18 months. Assuming that all of your hair will be gone after the minimum amount of treatments is crazy. Your body doesn't respond to any kind of medical or paramedical treatment with that degree of certainty, otherwise we'd have a cure for cancer. After six treatments, assuming that all is looking well, I will begin to space things out. Depending on the body part, usually I'll suggest a followup treatment at 6 weeks then another at 8 weeks after that. Then we sit back and see what happens. if another topup is needed, we can do it, or if nothing comes through after 3 to 4 months, we can say with reasonable certainty that the bulk of the hair is gone. At this point, you can start thinking about tattoos. If you decide to ink up before reaching this plateau of next-to-zero growth, you will definitely regret it. As further food for thought, tattoo removal is currently trending as the most popular male cosmetic treatment in Australia. Does Pulsed Light hair removal work on everyone? No. Around 1 in 500 people treated will see little or no effect. Scientists generally concede that they only know about 5% of how the body functions, and at this stage, the reasons behind this small percentage of ineffective treatments remain a mystery. I've been getting SIPL from you guys but I can't find it on the website. This only applies to clients who attended my branches in Southeast Queensland, as I've never advertised SIPL in Rocky. In Brisbane and Gold Coast, I stopped using the term in 2009, as our competitors started copying us, regardless of the equipment they were using. I now refer to our treatments by their precise name, PTF, to distinguish our machines from inferior equipment. PTF is simply an acronym for Phototherapy Flash. How painful is intense Pulsed Light hair removal? Done properly, it isn't painful at all. The body's pain receptor's are in the skin, not the hair root. The treatment should actually be quite boring and if you've ever been waxed, it's nothing by comparison. Clients often say that it's like a warm flick, and it passes in less than a second. Well, I'm going somewhere else and it really is hurting, and they're a qualified beautician/doctor/nurse. Good for them. if we're talking manicures or cholesterol, I'll concede to their relevant fields of expertise. We're not though. We're talking Hair Removal. At time of writing, IPL and Laser Hair Removal treatments are not taught as part of any Diploma of Beauty course in Australia, and it certainly doesn't form part of a medical degree. To suggest that someone's training in another field magically makes them an expert is akin to saying that a plumber works with spanners so he must know how to fix a car. The simple truth is that if you're receiving a treatment and it's painful, then the operator is using the wrong setting or a nasty machine, or has no clue what they're doing. I've been burnt from IPL by a mobile service to my town. They said it's normal. is that true? Apparently there is a mobile IPL therapist claiming to work for a company (I won't name it here) with 30 branches in Brisbane (this is definitely a lie), who is performing treatments once a month in country Central Queensland. I became aware of the problem through clients of mine whose friends were left with third degree burns. To date there have been five cases in Biloela, three in Gladstone, one in Blackwater, one in Clermont, and two in Emerald, and these are just the ones I've heard about. It definitely is not normal to be left with third degree burns after a Hair Removal treatment. To put that statement in perspective, I'll air Reef's dirty laundry. Back in 2009, one of my staff with three year's experience gave a lady a blister burn the size of a pea at our Mt Gravatt store in Brisbane. It was superficial and healed in three days. That's it. That's all our dirty laundry. In the 125,000 treatments performed since, at nine Reef branches across Queensland, we have not caused so much as a minor blister, and in our entire history, have never caused a third degree burn. The notion that twelve major burns from one therapist in one month is 'normal' is absolutely ridiculous. The operator is dodgy, untrained, and dangerous - There is no other possible explanation. Other places charge a credit card fee, consult fee, or room-use fee. What are your hidden extras? None. You pay the price as per the price list above. My consultations are free, I prefer plastic to cash, and I don't charge a room fee. No. prepayment of future treatments serves no purpose. Reef's prices are sharp already because I don't get bogged down with pointless paperwork. What could prevent me having a PTF Hair Removal treatment? This is an important subject - and a lengthy one - which I've covered in detail in the Reef Knowledge Base. To save clutter here, the link below will take you to the page, which lists the contraindications and reasons why you may not be suitable for treatment..
Is your equipment listed on the Australian Therapeutic Goods Register? Yes it is. I use several brands of machines and all are listed on the TGA register. They are also approved by FDA (US) and CE (Europe). I'm confused by all the jargon. SIPL, SPL, PTF, CPL, IPL, ELOS? What's the difference? That's a good question given the huge influx of suspect "IPL" machines coming into Australia. But first some legal mumbo jumbo you should get your head around. As well as being an abbreviation for 'Intense Pulsed Light' technology, the term "IPL" is also a registered trademark of Lumenis Israel (1994? ), which is the issue at the core of so many terms being used for the same underlying science. Over the years, other manufacturers began using the term and for whatever reason, Lumenis didn't stop them, which in itself voided their claim to the trademark. Regardless of that though, let me just make it clear that despite the fact that I do own a couple of Lumenis machines, Reef uses the term IPL as an abbreviation for Intense Pulsed Light technology, not to attach our marketing to that brand. In Reef's stable of IPL machines we also have Palomar, Luminex, GSD, Hua Mei, and Chromolite products. Like everyone else in the world, we simply call them IPL machines. OK, now back to the stuff that matters. All the various terms are similar in that they are based on Intense Pulsed Light technology, some with a few tweaks and twiddles. At the end of the day, it comes down to power output, filters, skin types, understanding of the science, and experience. Remember that a machine, no matter what brand, is only as good as the person using it. As I mentioned in the intro, my preferred system is an advanced variation on IPL called PTF. These machines are very powerful and the latest technology from Global Skin Dermatologists. In terms of safety, accuracy and results, my machines are leaps and bounds ahead of older IPL units and their painful predecessor, laser. 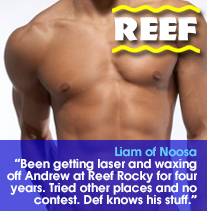 Unlike most hair removal chains, Reef is independent. I own Reef. It answers to no one, so I have the freedom to pick from the best technologies in the world, and I do. It's that simple. If you would like to know more about Pulsed Light, its variations, and the underlying science, the link below from my anatomy site explains it more comprehensively. Why do I need a preliminary consultation? Most people don't. Unless your skin type is Type 5 or 6 - Dark indian, African, Maori, or Aboriginal - and assuming that there are no other contraindications to treatment, we can perform the treatment on your first visit. 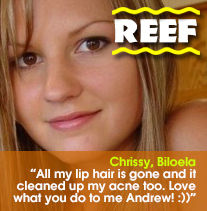 Reef's equipment utilises the latest filtering systems which also enables us to treat most Asian skin types. Your Intense Pulsed Light session takes around the same amount of time as a wax treatment for the same area. Allow an extra 15 minutes for your first treatment, as I need to assess your skin type and suitability for treatment, and discuss the procedure with you. I can get a cheap deal in Brisbane on a 'daily deal' site? Will you price match? What corners are discount places cutting in order to sell so cheaply? Why do they need to sell at a loss to attract customers? Will they still be in business to provide said services once they have your money? I said earlier that I have a lot of knowledge on this subject, and I do. It's a particularly sore point, and not just for the beauty industry but for retail in general. We're pretty safe from the discount coupon craze in regional cities, but in Brisbane and other high population cities around Australia, the problem is huge. Poor old Brisbane has copped it doubly hard, as a couple of Sydney-based discount laser chains have been conducting a long-running price war trying to put each other out of business, and Brisbane is the battleground. Into that chaos, throw in a dozen or so backyard operators using discount coupons and it really is a lucky dip down there now. And alas it's created a culture. Brisbane people expect to pay next to nothing for treatments now while still expecting the very best service and results. In reality though, that isn't how it works. The result has been that most, if not all, of the reputable hair removal centres - Reef included - have closed their doors in Southeast Queensland. The choice was to compromise on quality and join the price war, or sell a premium service for less than it costs to perform the treatment. Closing up shop is a no brainer. The steamroll effect of all the above has been that the quality of treatments in the capital cities is generally below par with those in the bush, simply because we don't have the population to make it worth their while. You used to do my treatments in Brisbane/Gold Coast. I want more areas done. Where do I go? This pretty much rolls on from the previous paragraph. I saw the writing on the wall in Southeast Queensland in 2010, and began closing down my southern branches as each lease ran out, while simultaneously relocating the company to Rockhampton, where it has been based ever since. Brisbane and Gold Coast were a bit of fun for ten or so years but it's over now without regret or a teary eye. 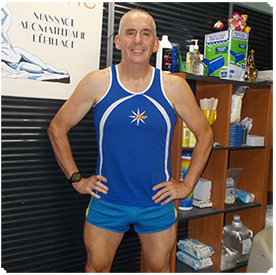 I closed my Gold Coast studios in 2012 and my last Brisbane branch in June 2014. When I recommence expansion, I will only be opening in regional cities. This has basically been the game plan since 2010, when I also renamed the business Reef (previously called Body Sync) to give it a more relevant flavour up here in the tropics. A friend was getting their treatments done at Reef Yeppoon but I can't find it. I used to perform treatments from my home in Yeppoon when I was living there, however we sustained a lot of damage from Cyclone Marcia and I've subsequently moved up to Rocky. I'm worried that I'll start treatments during a special promo and then you'll put the price up. There are two common responses during the weeks that follow a treatment, and we hark back to the inability of science to explain many of the wonders of the human body. I've thought about it a lot though, and both responses seem to be just as good as each other. Let's look at two hypothetical clients, Bob and Mary. Bob has his treatment and over the weeks that follow, the hair in the treated area simply stops growing. Even when his next treatment comes around, there still isn't much there. our theory on this response is that Bob's hair enjoys a particularly long anagen period, which keeps most of the hair shaft quite moist. Instead of just destroying the hair bulb during the treatment, we dissolved the shaft as well. Bob's body absorbs whatever proteins remain and the rest of the debris simply joins the lymphatic flow and passes out of the body unnoticed in his urine. Mary on the other hand, finds that her hair keeps growing normally as though she didn't have a treatment at all, BUT at about the 3 week mark, something "miraculous" happens. She molts. She wakes up one morning with a bed full of hair or it sloughs off one day in the shower. The reason for this 3 week delay is that every hair shaft has its own muscle, the arrector pili, which is the muscle that makes your hair stand on end when it's cold. The hair is also surrounded by other connective tissue that holds it firmly in place. At around 3 weeks, the dead hair, now disconnected from its nutrient supply and out of range of the muscle, simply falls out, leaving nice smooth skin. To a nerd like me, it's all fascinating stuff. If you've heard of any scientific studies conducted on the subject, I'd love to hear about it. My daughter wants Brazilian PTF treatment. How old does she have to be? Eighteen. I'm not a fuddy duddy but I think the decision is up to her as an adult. I will do a standard bikini at 15 with the mother in attendance, but that's it. How effective is intense Pulsed Light on blonde, grey or red hairs? Not very effective at all. Despite various manufacturers' promises, low melanin equals low results. Some manufacturers make grandiose claims but when I push them for the science to explain how their amazing technology works, they come up blank. See the next paragraph re Aboriginal clients. While the result will be significantly slower than light based treatments, Active Enzyme is still quite good on pale hairs. I'm of Aboriginal descent. is my skin too dark? Chances are, yes you are, even if your skin is quite pale. The same applies to people of African, Caribbean, or Pacific Island descent. Pulsed Light and laser target dark melanin in the base of the hair root, and unfortunately, melanin is also the compound responsible for giving you dark skin. What this means is that if I fire a shot from the machine on your skin, more often than not, it will hurt and possibly burn you, and very likely, it will fade the skin in the area leaving you with a very white patch. While the treatment will no doubt eliminate your hair, the damage to your skin makes the risk too high to consider performing the treatment. Electrolysis is an option for you, but I don't offer this treatment. It is also quite painful. Another alternative is Active Enzyme Hair Removal. This is a protein-denaturing lotion applied immediately after waxing that is designed to starve the hair root in the same way that IPL or laser does. Is Reef accredited by Queensland Health for pulsed light treatments? Despite a huge amount of misleading advertising around the ridges, no business is accredited by Queensland Health for pulsed light treatments. Why? Simply because there is no such thing. Queensland Health only issues accreditation for laser, not pulsed light, as laser equipment emits radiation. We don't like laser equipment and we don't use it. I won't take part in the misinformation war. If your treatments are so good, why are you so much cheaper than other places around town? I keep unnecessary expenses trim, and instead focus on the quality of product I offer. That simple. Why doesn't Intense Pulsed Light remove all the hair at once? Intense Pulsed Light targets a chemical compound in the hair called melanin, which gives hair its dark pigmentation. Melanin is most prevalent in hair during the early anagen phase of hair growth (when the hair root is still "juicy") and hairs in this stage of growth are most susceptible to eradication. Hair grows in different cycles, usually between 6 and 12 months, and ongoing treatments are needed to catch each hair as it passes through this early-anagen stage of development. Will I have to come back for top-up treatments? Some hair can lay dormant for long periods or emerge for the first time as you arrive at a certain stage of life. We can only kill hair bulbs that are actively sprouting. For that reason, you will find that top up treatments from time to time are beneficial. I'm male. Will a Brazilian Intense Pulsed Light treatment affect my sperm? I told my Reef Therapist to turn up the machine to maximum power and they refused. That's because Reef staff are thoroughly trained in using our equipment and you're not. It's very common in some Asian countries and even some clinics here in Australia to disregard safety protocols when it comes to skin types and filters. We don't. You cannot fight your biology, and I have zero tolerance for pushy clients who try to threaten, guilt, or bribe staff to break the safety protocols that we've established from the experience of several hundred thousand treatments. I'm pregnant and my top lip is sprouting thick dark hair. Can you help? Unfortunately no - You'd be throwing your money away. Hair growth during pregnancy is hormonal, and no amount of treatments, whether through Reef or someone else, will make the least difference. In the case of pregnant clients, I recommend waxing until the end of term. Reef's policy in general is not to treat pregnant clients with pulsed light. While there is no scientific evidence to suggest that pulsed light can harm an unborn child, I prefer not to take the risk, especially in view of the fact that a treatment will serve little purpose. Can you wax my chest and IPL my stomach at the same appointment? Yes, if you tell me when you book. For various reasons, people often combine waxing with IPL but I do need to know in advance. I'm a therapist and have a client with dark skin. Is there a safe way to do a treatment? If you asked this question instead of risking your client's skin, you have the makings of a good Hair Removal technician. In the end, you will have to make the decision on your own, but I can tell you how I make the call, and I can't remember the last time I got it wrong. The Fitzpatrick Scale aside, a good therapist needs to learn to trust their visual instincts above all else because clients don't always answer the questions correctly or accurately. It does take a few years to trust your eye instead of numbers, but in the end, it will stop you appearing as a dodgy operator on Today Tonight. When a client walks through the door, I immediately judge their skin type. Most are a Type 3 or 4. Up to Type 3, you have a fair bit of play room with settings. Type 4 onwards, this is where mistakes happen and you need to start looking for subtleties. I could lecture on that all day so I won't, but in short, I use a two-level gauge that I call 'Indian Skin'. This doesn't just apply to people with Indian ancestry, but generally to any olive skinned people whose ancestors lived along the equator. Mediterranean, South Asian, North African, and so on. With Indian people though, there are two distinct skin tones; one is quite pale and the other quite dark. Spend an hour people watching at a cafe and you'll see what I mean. You'll notice that people of other races, e.g. Spanish, Greek, Indonesian, Italian, Arab, Egyptian also fit into these two Indian Skin profiles. Pale Indian skin is ST4, while darker is ST5 or higher. Skin Type 4 can generally be treated the same as you would a Caucasian skin with a mild tan, meaning you would add an extra filter and reduce the joule output about 15%. This is of course a general guide. If your instincts don't feel comfortable with this idea, then you are well within your rights to perform a patch test. Always consider safety first, and remember that you're training your instincts, not listening to mine. Darker Indian skins are ST5. NEVER treat on the first visit and ALWAYS perform a patch test. Performing a patch test: First inform your client of what you would like to do. Explain that their skin colour poses a risk to treatment, and that with their consent, you would like to treat a small patch of skin in an inconspicuous place. Explain that the patch test may cause pigment damage that could take several months to return to its normal shade, however that outcome is better than causing trauma to the whole area. When you tell them this, it will make the client fully aware and they will take the situation seriously. At this point, they may elect not to continue, and don't force them. If they decide to go ahead, find an inconspicuous patch of skin anywhere on the body that is the same skin tone as the area you want to treat. Then take a paper wax strip, fold it in half lengthwise and cut out a small triangle shape the size of your fingernail. Open it up to form a diamond, then lay the wax strip flat on the test area. Apply ultrasound gel to the skin then fire a single shot on the lowest setting with the strongest filter. Then move the strip only slightly and fire a second shot overlapping the first so that it forms a double diamond. It is important that you test with an overlapping shot, since as you would know, all shots should overlap slightly to ensure complete coverage of an area. This small test will determine whether the client's skin can handle the treatment. Your client now needs to go away for two weeks then report back. Tell them to note any changes to their skin during that time. If the client reports back that the skin is still darker or lighter than normal after two weeks, then you have proven that they are definitely not suited to treatment. If the client reports that nothing happened to the skin AND you can see that for yourself as well, then it should be fine to perform a treatment on the settings you used for your patch test. When you perform the treatment, stay super-aware of what's happening and look for any warning signs. If you have any doubt at all, stop and observe for a few minutes to ensure any pinkness, discomfort etc fades away. If at any point, the client says that it's hurting - Stop! Remember that pain is a definite contraindication, and if your treatment is causing pain, then you're hitting skin, not hair. Yes, I am very aware of the situation. I do have a long association with many of your fellow franchisees and with the parent company behind the original franchise network. As to the current situation, no doubt you're wondering why your chain doesn't change back to the old machines. That answer is easy. The new equipment appears to be more about selling franchises than removing hair. Its big selling points are the 'guaranteed' ridiculously high shot count, and just as ridiculously fast treatment times, which suggests a higher turnover rate of clients with less overheads. These factors sound wonderfully attractive to prospective new franchisees with 150K to spare. In reality though, the shot count is higher and the treatment times are faster because the joule output of the new machines is very low. According to the only evidence I can find, that output is between 7 and 12 Joules, which puts this amazing new tech in a similar league to some handheld piece of junk you could buy off eBay. You only have to watch the much-touted video to see how weak the flash is. Unfortunately for franchisees, this translates to less effective treatments and that's why your customers are screaming. Your old machines weren't great but they were miles ahead of these feeble things, and now your existing clients aren't getting the results they are used to. As for new customers, even with the lower prices now on offer - basically an admission that the quality is inferior - they aren't going to pay $200 for a ten minute treatment, especially one that doesn't work. So what can you do? Seek legal advice. You bought one of those franchises and you need to hold the franchisor accountable. As a starting point, I would suggest that you look at the claims being made by the franchisor in their advertising. I believe that you will find that this amazing new European infra red technology is anything but new. In fact it sounds just like ELOS which is rubbish in its purest form, let alone as a watered down version. You may also have a valid point of contention in that they claim the machines are exclusive to your chain. A quick Google search shows several clinics in Australia using similar equipment.